Terminator 2, Judgment Day T-1000 Liquid Morph LAPD Police Badge Prop Replica - Full life size, an Authenticated Haunted Studios replica of screen used LAPD Badge worn by Robert Patrick as the T-1000 Terminator. 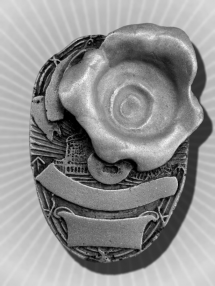 Cast in resin and finished with a fine silver coating and black patina to bring out the detail, this badge is great for display or as part of your T-1000 Halloween costume. Includes a metal pin back for attaching to your clothing or for display.